I have a milk allergy. As in headache, runny nose, and itchy throat if I have too much dairy. Growing up with a milk allergy was not very fun. This meant extremely limited amounts of ice cream, pizza, macaroni and cheese, and all those yummy foods that kids love. To make matters worse, dairy free substitutes like coconut and almond milk, that are now in abundance, were almost impossible to find, especially at a reasonable price. Which meant that pouring a can of soy baby formula over my cereal in the morning was a common occurrence. Now, things have changed, and I am so thankful that non-dairy options have now come into style. But all my non-dairy struggles over the years have introduced me to goat cheese, and I am more than ok with that. I love goat cheese. I could eat it everyday. The best part is that it can replace regular cheese in many recipes without changing the taste or texture. 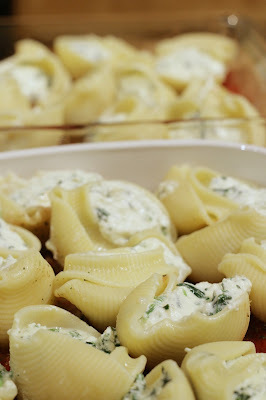 If you struggle with dairy problems, or not, I hope you like my version of lemon garlic stuffed shells! I made this recipe like I make most recipes, using pinches and handfuls of ingredients so all measurements are approximate. I like my pasta with a lot of garlic, so feel free to adjust the seasoning to your liking. 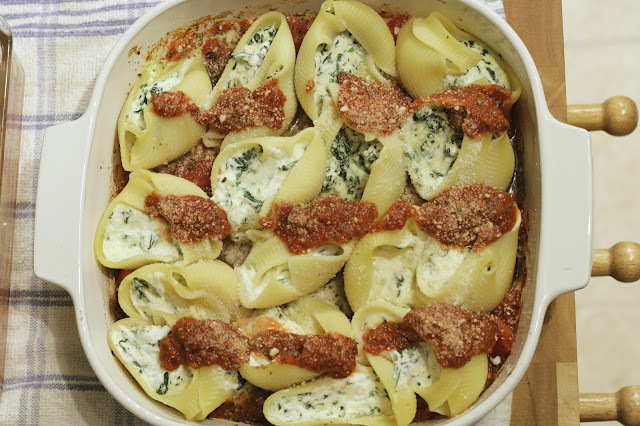 This recipe will fill about 20 shells. 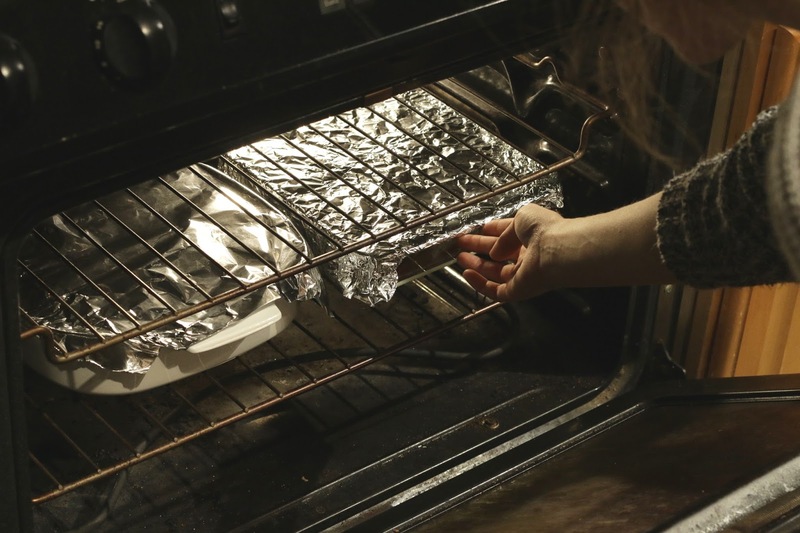 Prepare a baking dish by first drizzling it with olive oil. Then add the diced tomatoes and seasonings and swirl a little until evenly distributed. Mix the filling by combining the goat cheese, lemon, spinach, zest, and salt and pepper in a small bowl. 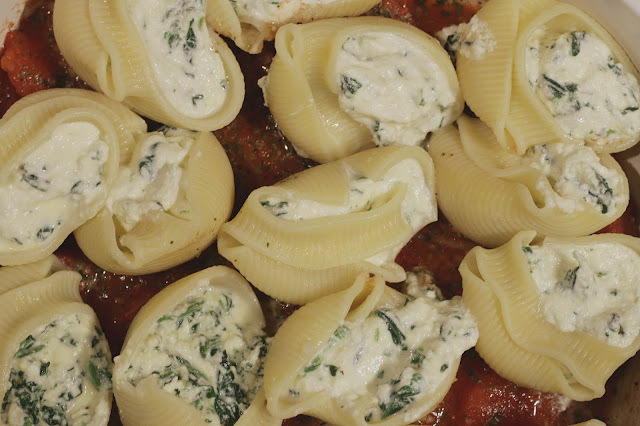 Make sure to squeeze all the liquid out of the spinach so that your filling isn't too thin. Then beat in the egg. I find that the filling process goes a lot faster and cleaner if you use a piping bag. You can also use a gallon size storage bag by cutting off one corner after filling the bag. 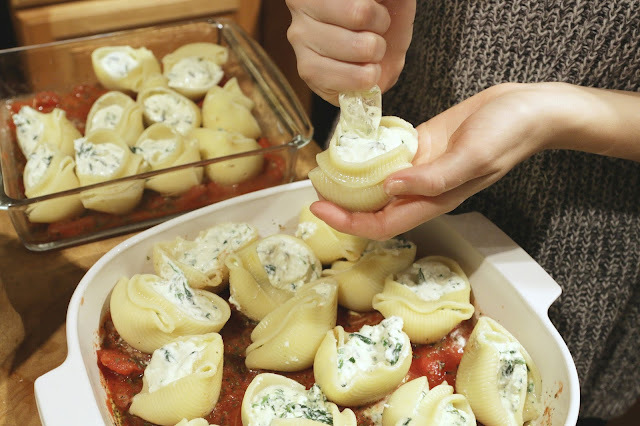 Fill each shell and place into your prepared baking dish. Cover and bake for 25 - 30 minutes. 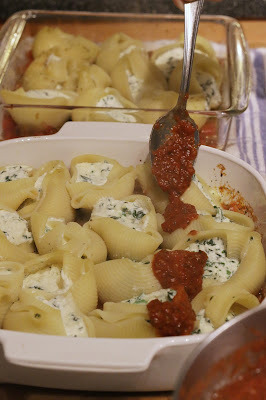 *I had some leftover homemade tomato sauce from my garden in the freezer, so I ended up using some of that over the top. You can also double the tomatoes and spices in the recipe if you like a lot of sauce. Yum! This looks really good. I am personally not a super fan of goat cheese, (one or two bad experiences, and we're kinda scared of trying it again. 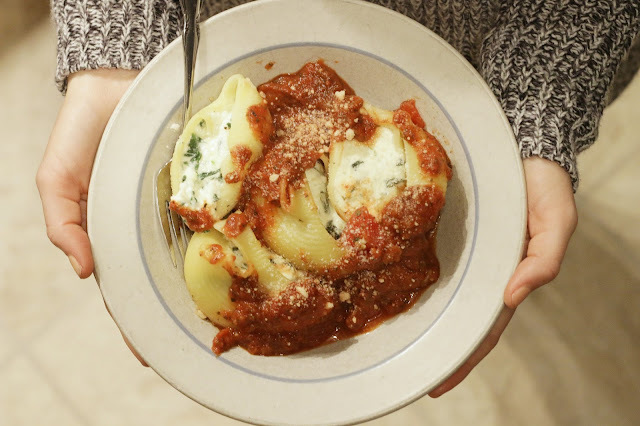 :) ) But I think I'll have to try this with regular cheese! I'm a bit curious, do you prefer to use the softer cheeses or which do you prefer to use? I ask because I have been allergic to dairy my entire life, but I've never liked the softer cheeses that most people refer to when they speak of goat cheese. My family did find a company called Mt. Sterling that makes mozzarella and cheddar goat cheese, I've found them act almost exactly like "normal" cheese and much preferable on things like pizza. Hey Daniel! The soft cheese you're talking about can also be called Chevre, which is French for goat cheese, or farm cheese, which is just a simple way of making cheese that can be made from cow's milk as well. For labeling and grocery purposes, this form of cheese is what is typically know as just "goat cheese". I've never tried goat cheddar or mozzarella, but I have had goat bri and it's pretty good. It's kind of my dream to one day have my own goats and to make my own cheese, but we'll see if that actually ever happens. Thank you for sharing that brand. I'll have to check it out!